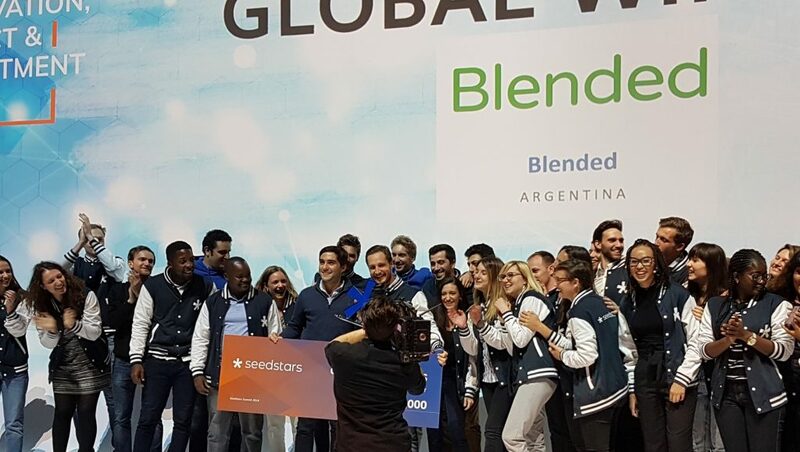 Argentinian edtech startup Blended has been crowned 2019 Seedstars Global Winner at an awards ceremony in Lausanne, Switzerland on Friday evening (5 April) and walks away with up to $500 000 in equity investment. Blended, which was founded in 2015 by Federico Hernandez (pictured above, receiving the award) and Nicolas Andres Gimenez, aims to improves communication between schools and families with a communication platform that generates engagement between parent and teachers. The awards took place at the SwissTech Convention Centre at the conclusion of the sixth annual Seedstars World Summit. Argentinian edtech startup Blended has been crowned 2019 Seedstars Global Winner and walks away with up to $500 000 in equity investment. Every year, the Seedstars team roams the world to scout for the best startups in the emerging markets. A total of 8000 startups (up from 5000 the year before) applied to the 2018 series of the competition (to stand a chance to become the 2019 winner), with over 900 selected to pitch at the sessions hosted in about 75 countries. Canton Vaud Public Prize: YNMO (Saudi Arabia) allows service providers including schools, centres and clinics to design and monitor individual treatment plans. Tag Heuer innovation prize: Wobot (India) helps businesses make sense of CCTV data using a layer of artificial intelligence (AI) that is taught to do surveillance on behalf of the human eye. Merck life sciences prize: Oxpecker Labs (Hong Kong) has developed the world’s first patent-pending, non-invasive sweat sensor that helps users to prevent dehydration and heat stroke. Rising Tide empowerment prize: 7kemma (Egypt) is an on-demand home nursing service. Those startups from South Africa that have taken part in the competition since its inception are: Franc Group (2018), EM Guidance (2017), ID Work — now called Kandua (2016), Giraffe (2015), Lumkani (2014) and GUST Pay (2013). Ventureburn was a guest of Seedstars at its annual world summit which took place last Friday (5 April 2018) in Lausanne, Switzerland.